Mark Simpson and his wife, Sheila Bolduc-Simpson, spent a memorable 10 months in Kigali, Rwanda. 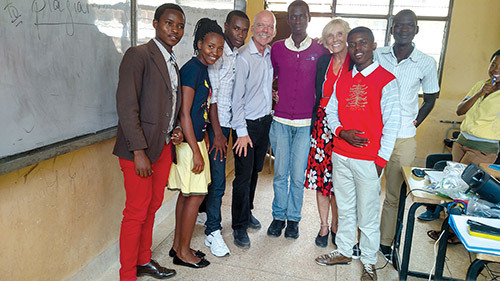 The life-changing experience came about through a Fulbright Scholar grant that FGCU education Associate Professor Mark Simpson received to teach at the University of Rwanda, College of Education. Bolduc-Simpson is an instructor in FGCU’s Department of Language and Literature. During their sabbatical, the couple also reached out to the local community and presented at other academic institutions, worked with the U.S. Embassy and taught a test preparatory course for advanced English students. Simpson also advised the university’s debate club. Following are excerpts from their blog about the experience. On the evening of Sept. 1, the lights of this city of one million-plus people were glimmering below us as we landed at Kigali International Airport. The air was refreshing as we exited the plane onto the tarmac for the short walk to the Arrivals Hall. Temperatures in Kigali ranged from the mid-60s to the low 80s in the fall. Kigali is 100 miles south of the equator and about a mile high. We noticed that the streets were super clean and free of litter, people don’t smoke in public or eat or drink on the streets. On Friday, our Embassy guides showed us apartments. Rubangura Apartments soon would have a one-bedroom apartment available on the third floor with a view of the pool and the surrounding hills. It would be our home for 10 months. Well, not exactly. 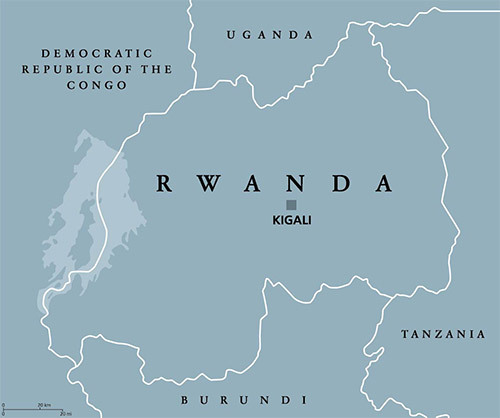 Work visas and government ID cards for living and working in Rwanda require CVs, diplomas, stateside police clearance reports, marriage certificate, birth certificates, the Fulbright contract, a letter from sponsoring host organization, photos – and time. Off we and the documents went to the Rwanda Directorate General of Immigration and Emigration. A week later, the work visas arrived and a few weeks later, ID cards followed. Sheila was given permission to assist and received a spousal work visa, giving Mark a teaching assistant. Two-and-a-half weeks after our arrival, the English teaching methods course started and, we were informed, students were slowly showing up for class. With only a few hours to prepare for our first class and lacking a formal curriculum description, we met our students. Half of our 55 students were present. We spent the first class introducing ourselves and exchanging information with them. Public education is not free here. New students pay 65,000 RWF (about $80) in fees: application fee, registration fee, medical and life insurance and a student union contribution. Tuition is 900,000 RWF, or about $1,100. There are government sponsorships for those who cannot afford this, and most students cannot. No one seems too concerned that the semester has begun while some classes have yet to be scheduled. We carry to each class a laptop on which we have developed a PowerPoint presentation; a projector; a portable speaker; and connecting wires. Our classrooms have only one working electrical outlet so we place the projector in the front of the rooms and project above the white boards. We discovered that Class Representatives, individuals in each class chosen by the group to be intermediaries between teacher and students, are integral to an effective working environment. For example, if the electrical outlet is not working in the classroom, the CR will contact the building superintendent; if handouts are to be given to students, the CR will arrange the printing. Officially, the spring semester started Feb. 6. But we didn’t have courses to teach or a timetable. One reason for the delay was that first semester final exams were still being graded and no grades had been posted on the campus notice boards. We were first given the Survey of African Literature course, but the next day it was decided that the Introduction to World Literature in English course would be more appropriate for the Fulbrighter (and his co-teacher). The first week we worked on a rough syllabus. On week 2, we went to the GF (Ground Floor) Room 6 classroom on Wednesday for the class, waited and no students came. We had incorrectly read the schedule and were supposed to have class in 3F (3rd Floor) Room 7. The next day we went to GF6 for the second class. Still no students. After 15 minutes, we went to 3F7 and found four students patiently waiting for us to arrive – their mistake this time. We had a great two-hour conversation and sorted out who would serve as the Class Representative and inform the others we were ready to begin. On week 3, we were back in GF6. Thirty or so students streamed into the class. We gave a big shout out to Peter for getting the word out to the students. Our last Test of English as a Foreign Language preparation class focused on how to write the college essay that most universities require as part of the application process. We spoke about how to organize the essay. We covered some DOs and DON’Ts, and concluded with a mini-workshop on writing effective introductions, ending with a class photo. Rwandan college students celebrate the end of classes with Mark Simpson and Sheila Bolduc-Simpson. Our 10-month sabbatical in Rwanda has come to an end. Although we didn’t think there would be a big learning curve with our Rwanda assignment, the first semester did provide some surprises and challenges. We learned to step back, not push for answers, and go with the flow. We relearned the importance of flexibility with regard to our assignments and duties. A third important lesson was the result of reflecting on the many privileges we “haves” bring with us. Shortly after arriving in Rwanda, it became obvious that those who have access to material things are expected to share them. Acquaintances requested money to replace a stolen cell phone, obtain a driver’s permit, go back to school, start a business, and buy medicine for a sick relative. We wanted to be generous, but not naïve. With this great economic divide between us, it was hard at times to maintain balanced relationships. The people we met impacted the way we relate to people. Taking the time to greet every single person one comes in contact with is very important in African cultures. Rwandans make time for other people. The experience of living and working in Rwanda will remain with us forever. We hope we have become better educators, better human beings, and more responsible global citizens. We leave Rwanda with much more than we arrived with. We are grateful to FGCU, the Fulbright Scholar Program, and especially the people of Rwanda. Farewell. Murabeho. To see all 20 chapters, which include photos and descriptions of their travels, go to Mark Simpson and Sheila Bolduc-Simpson’s blog.